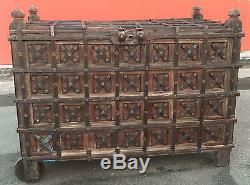 For sale is a huge and extremely heavy antique Indian dowry chest or trunk. This piece is very large. 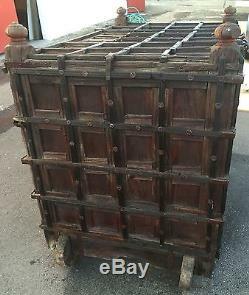 It would make a spectacular statement piece in any room. Put a piece of glass on it and have an awesome table. Has two wheels to move. Originally, it would have had 4. Has 6 secret compartments for valuables. These were created so that the robbers wouldn't get the good stuff when the family was rolling the chest off to the wedding. 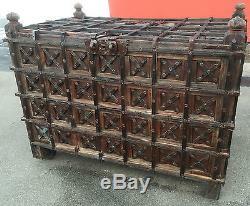 There are 4 compartments you access from the top. Open the top door and you can then slide out a panel from the top. Once that panel is removed, you can access one compartment. Slide another panel over the first and access the second. Then, there is a false bottom. There are 2 compartments at the bottom. You can access the bottom compartment by removing two pegs from inside. Once you pull out the pegs, you can remove the panel from the front. There is a bit of work needed. The false bottom boards need to be slid back into place. The inside will need a good cleaning. The wood has a good smell to it. I oiled the wood with lemon oil to bring back some of the darker grain. It needs more lemon oil. It has been a long time since this piece was oiled. The dimensions are roughly 4 ft 10 inches long by 4 ft high by 3 feet deep. There is only one peg to hold the bottom compartment door in place. 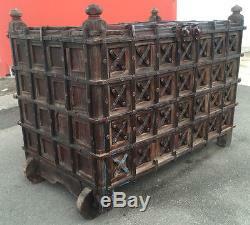 Metal is rusted and wood is dried from extended exposure. I will work with a shipper if you arrange and pay for it. It is massive and heavy, though. 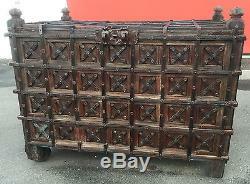 The item "Antique Indian dowry chest or trunk wedding 6 secret compartments wood wheels" is in sale since Friday, March 25, 2016. 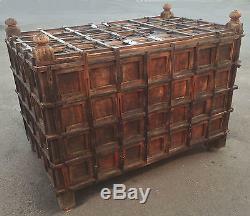 This item is in the category "Antiques\Furniture\Chests & Trunks\1800-1899".flynn" and is located in Newport Beach, California. This item can't be shipped, the buyer must pick up the item.